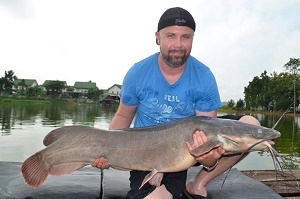 The second day of Ryans Thailand fishing holiday saw the angler once again fishing at Palm Tree Lagoon in Ratchaburi. After landing a good sized carp on the previous day the angler cast out his rods in readiness for more action. The first rod to receive a take was the predator rod fished to a quiet marginal spot. With the rod bent well into the unseen predator it charged off along the margins. Several minutes later a large set of whiskers could be observed revealing the culprit to be a Vundu Catfish. 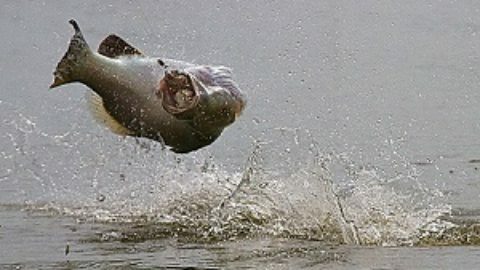 The Vundu Catfish was estimated to weigh 12kg and released after a few trophy shots. A gentle tentative take on one fo the carp rods soon saw Ryan attached to another fish. The fish on this occasion did not display a great deal of power and was beaten after only a few minutes on the heavy carp outfit. On netting the fish it was observed to be a very special capture. A Vulture Catfish was proudly displayed for the camera in all its glory. Weighing only 4kg’s this incredibly rare species is one of only two stocked into Palm Tree Lagoon.